Make your Tripp Trapp high chair a comfy and eye catching piece of furniture for your baby or toddler with this wipe clean seat cushion by Blausberg Baby. 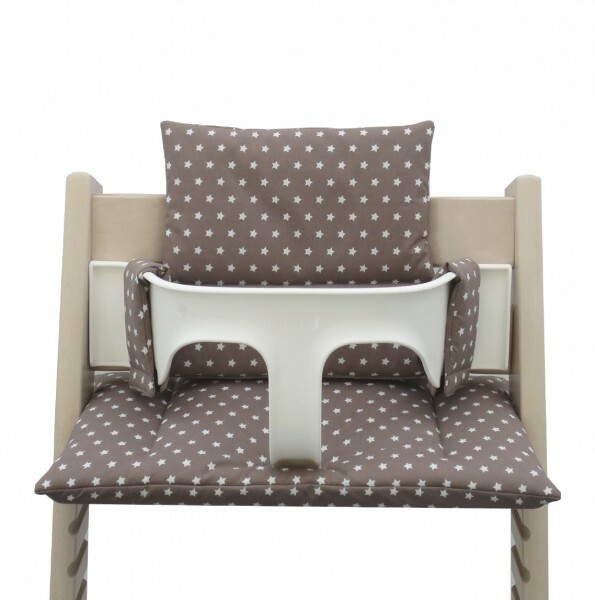 The cosy padding ensures a relaxed and agreeable sitting experience for your little one. Our set comprises two cushions, one for the bottom and one for the back. They have been especially designed for the Tripp Trapp high chair and fit to perfection. Compatible with the baby set by Stokke (or with the formerly produced leather strap). The back piece can be used on the baby seat or the toddler seat. You’ll simply have to adjust its size by using the Velcro on the back of the cushion. Easy and simple to fit and to remove. The coated fabric is 100% cotton. The padding is 100% polyester fleece and certified Ökotex-100-Standard. All our products are made in Hamburg, Germany - from the first cut to the final stitch.